Sign at the Redwood Valley Grange. We've also put together a list of resources for people affected by the fires, which we're regularly updating. You can find it here. The Community Foundation of Mendocino County, working with North Coast Opportunities, has raised over $700,000 for fire relief from more than 1130 donors over the last several weeks. There is immediate financial assistance available for people who have been impacted by the fire, and $50,000 has already been disbursed. The Community Foundation is also developing long term plans to provide rebuilding assistance and other resources to fire victims. President Megan Barber Allende wrote in a statement, "The Community Foundation is committed to being part of the healing process and will continually assess and evaluate the needs of our community throughout the journey ahead." 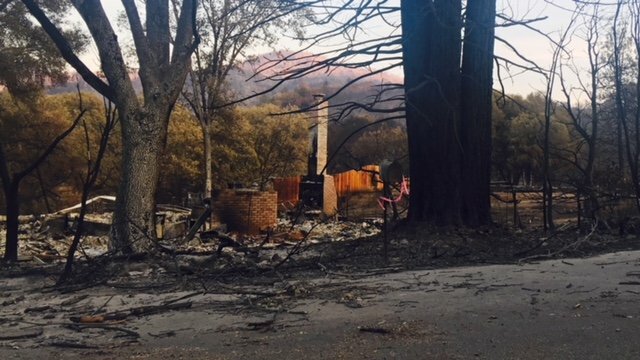 The North Bay Fire Relief Fund, set up through collaboration between the Redwood Credit Union, State Senator Mike McGuire, and the Press Democrat, is taking donations to help with both immediate and long-term rebuilding needs. You can select which county you'd like to donate to when contributing, and North Coast Opportunities will be distributing the funds in Mendocino and Lake Counties. "Neighbors who lost their homes can apply for an immediate $1,000 to assist with essentials such as rent, food, clothing and other personal necessities. The Fund is also investing an immediate $750,000 to provide every student in Lake, Mendocino, Sonoma and Napa Counties with a $250 gift card to replace school clothes and supplies," according to a press statement from McGuire's office. The Good Farm Fund has started a fire relief fund, as has the Farmers Guild which has started a "North Bay Just and Resilient Futures Fund" to assist farmers, more information here. Tickets proceeds from the Homebrew Festival (details below) will go directly towards farmers impacted by the fires. The California Growers Association has set up a fund to assist cannabis farmers who have been affected by the recent fires as a collaborative effort between groups in several counties. The fund's purpose is to assist in long-term compliance efforts for cannabis growers' who need help with fire damage. Get in touch with them at [email protected] to donate or let them know you need assistance. Mendocino Generations has also set up a fire relief fund on GoFundMe to help local cannabis farmers. Mendocino Strong Together - Saturday, Nov. 4 at the Ukiah Fairgrounds from 4 - 10pm. Featuring music, tri-tip dinner and tacos, an auction, and much more. See the full details below; updates will be posted on the event's Facebook page. Tickets are available at all Mendo Mill locations, Mendocino Bookstore, Chavez Market in Ukiah, JD Redhouse in Willits, and Geigers Market in Laytonville, and at brownpapertickets.com. They are $20 in advance, $25 at the door, children under five are free. Fighting Fire with Fashion - Saturday, Nov. 4 at North School Street in Ukiah from 12 - 3pm, a fashion show for fire relief victims that will go towards the Community Foundation's Fire Relief fund. Tickets can be purchased from Liv Fashion Boutique, Dig! Music, and the Ukiah Valley Networking Agency; or bought online at brownpapertickets.com. Questions about how to get involved should go to the Ukiah Valley Networking Agency. "There are over 17 local boutiques that have models hitting the runway with the hottest styles for the holiday season, not to mention a raffle packed with local merchandise . Eddie's Cocina and Ellie's Mutt Hutt will have delicious lunch options available and the Ukiah Main Street Program will have local beers and wine on tap for while you enjoy the show." Inaugural Mendocino County Homebrew Festival - Saturday, Nov. 4 at the Ukiah Valley Conference Center from 2 - 6pm. Taste over 50 beers, vote for the People's Choice Awards, learn from local experts, enjoy a farm-to-table dinner, with tickets going to the Good Farm Fund's farm fire relief fund. More details can be found in our article here, and you can get updates on the event's Facebook page. Community Benefit Celebration - Sunday, Nov. 5 at the Saturday Afternoon Club in Ukiah from 1 - 4pm, free. "An afternoon of performances towards renewing gratitude and resiliency after trauma and challenges; dancing, drumming, poetry, tai chi, and gratitude blessings and insights. In honor of our responders, survivors, friends and neighbors, all ages are welcome. Performers include Weird Year, Woman’s Inland Chorus, Paula Samonte and Students, Senegali Drummers, Tara Sufiana, The Raging Grannies. Spoken words and blessings by Bill Churchill, Michael Riedell, Linda Noel, and Roberta Werdinger," plus an open mic, and food! Art from the Heart - An exhibit and fundraiser at Willits Center for the Arts and the Corner Gallery in Ukiah. The show will be at the WCA until November 5, then moves to the Corner Gallery. From the WCA Facebook page: "15 artists are each donating a piece to raise money for the Community Fund-Fire Relief program. We are having a drawing where you can buy a ticket for $10 or 6 tickets for $50. You can put your tickets into an envelope for the piece you want. 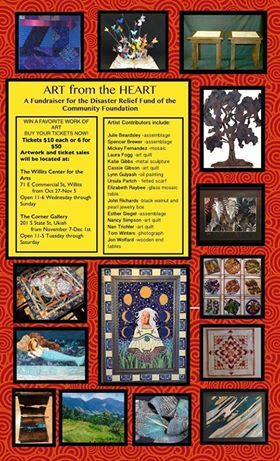 The donation exhibit will be at the Willits Center for the Arts from this Friday for the next 2 weeks. After that, the exhibit will go to the Corner Gallery in Ukiah and be there until the 2nd week of December when we have the drawing. This is your chance to get some beautiful valuable art for $10!!! Come on down and buy a ticket or buy lots of tickets! On display now at the center. Other artists from Mendocino County have generously donated their work to the drawing also. Check it out! 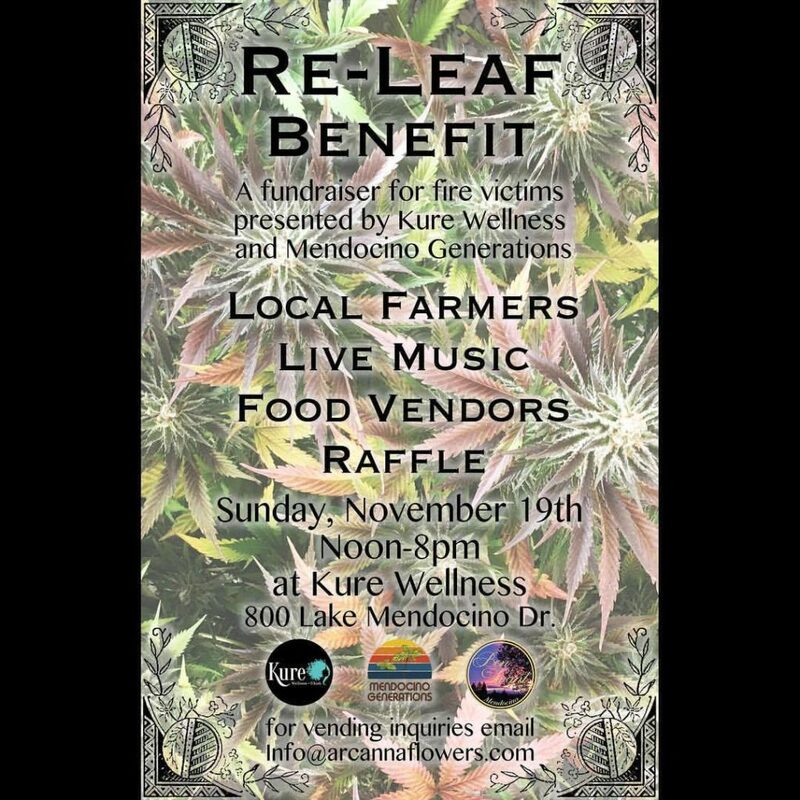 Kure Wellness Fire "Re-leaf Benefit" event - Saturday, Nov. 19, at Kure Wellness at 800 Lake Mendocino Drive in Ukiah from 12 - 8pm, featuring local food, music, farmers, and a raffle. Interested vendors should get in touch at [email protected], we'll update with more details when they are available. 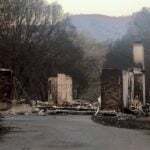 "The outpouring from Mendocino County’s artists, businesses, entertainers, wineries, breweries, hospitals, radio stations and volunteers is over the top for Mendocino Strong together, the fundraiser to assist families, neighbors and friends after the horrific Redwood and Potter Valley fires. Greg Schindel, The Train Singer will greet attendees at the door with his uplifting repertoire. Once inside, music by local performers fill the hall from 4pm until 10 pm. Opening the onstage music is the Margie Rice String Quartet, followed by Alex DeGrassi, Spencer Brewer, Ed Reinhart, Paula Samonte, John Mattern, and friends. The place gets rocking around 8pm when Waylon and the Wildcats take the stage followed by the Johnny Young Band. Sheriff Tom Allman shares his magic as auction maestro and master of ceremonies will be State Senator Mike McGuire for the Emcee beginning at 6:30 pm. Silent and live auctions feature unique lots including custom made benches, a life size horse from Willits Furniture, a child’s John Deere Tractor, 49er tickets, a private plane excursion and stay, many several day stays with luxury accommodations, private dinners and concert, too many wines to list, fabulous baskets from individuals throughout the county and much more. Art donations include an exquisite vessel by the internationally known Potter Valley artist Red Wolf. Other artists, chefs and entrepreneurs affected by the fire are putting items together including Jan Hoyman, Ken Chapman of Habitat, and caterer Kristin Myers. Destination items include a condo in Squaw Valley, a Hawaiian home, Charlie and Martha Barra’s Marfino overlooking the ocean in Fort Bragg and more. Howard Memorial Hospital donated a gift basket worth one thousand dollars. Dinner is served from 4:00 to 7:00 and is a choice of taco and sides by Chavez Market, the Tri-Tip feast is prepared by the Redwood Empire Lions, Anderson Valley Lions and Willits Lions Club plus a vegetarian selection of risotto and amazing salad. Full bar service by Ukiah Host Lions. Beer is from North Coast Brewing and Eagle Distributing. Handley, Fetzer, Barra, Frey, Parducci and Destination Hopland donated cases of wine. Coyote Valley Casino is providing water and soft drinks. And there will be appetizers and desserts. Mendocino Strong Together, including music, auction, dinner and dancing, takes place Saturday, November 4, from 4-10pm at the Redwood Empire Fairgrounds in Ukiah. 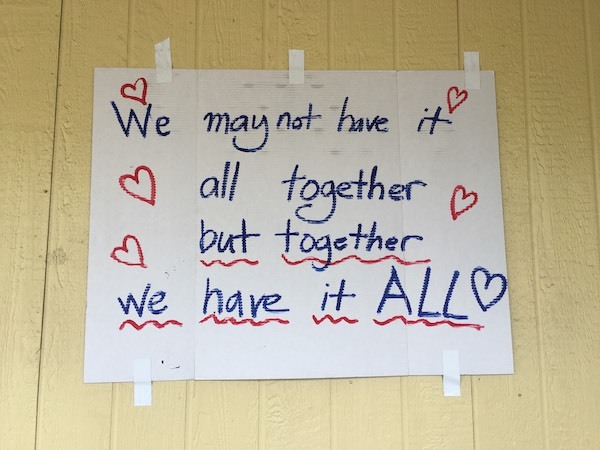 Donations for Mendocino Strong Together are coming from near and far. North Coast Brewing Company, Beckstoffer Vineyards and MendoFutures contributed $10,000 each. Bob Perkowski designed a t-shirt of which more than 100 have already been sold. Auction items for the Grand Local Auction of Great Items may be donated by calling Katie Fairbairn at 468-3164 at the Mendocino College Foundation to donate. Auction donations may be dropped off at the 1000 Hensley Creek Road from 9:00 am-12:00 and 1:00-4:00 pm. Deadline is November 1 at 4:00 pm. Financial donations to support Mendocino Strong Together may be made at any branch of the Savings Bank of Mendocino County. All donations are going directly to those in need, are tax deductible and are being managed without a fee by North Coast Opportunities. 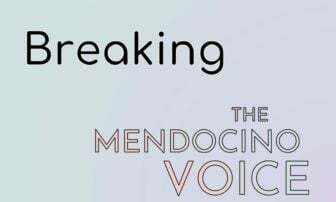 More information and updates are available at the Mendocino Strong Together Facebook page. Tickets are available at all Mendo Mill locations, Mendocino Bookstore, Chavez Market in Ukiah, JD Redhouse in Willits, and Geigers Market in Laytonville. They are $20 in advance, $25 at the door. Children under five are free. 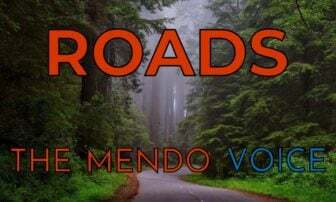 More information can be found on the website at MendocinoStrongTogether.com. Tickets are also available on line via the website at Brown Paper Tickets." Also consider the Redwood Empire Food Bank in Santa Rosa. They are suppling groceries to the evacuees in shelters and in motels.